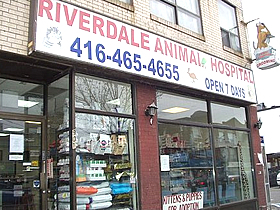 A small animal practice including exotics, Riverdale Animal Hospital was founded in 2001 by Doctor Christopher Drabant. With up-to date procedures and protocol, Riverdale has maintained its reputation of a solid practice not only with its medical equipment and diagnostic technology, but also with its highly skilled staff. Riverdale’s main mission is to give the most ethical and professional care in services not only to the patient but the clients as well. To provide even more efficient service to the increasing demands of both the patient and the client, Riverdale is associated with many veterinary specialists, diagnostic laboratories, and government institutions. Riverdale Animal Hospital is accredited by the College of Veterinarians of Ontario for meeting the standards and regulations set by the committee of the licensing body. The CVO committee regularly conducts on site inspections on facilities along with record keeping and issues certificates to complying companion animal hospitals in the province. Compliance with the standards and regulations set by the accreditation committee of the CVO is always observed at Riverdale animal Hospital. Aside from providing clean and modern facilities for you and your pet, the management of the hospital makes sure that records are well managed, and confidentiality is always exercised. We make sure that you and your pets are always comfortable with good ventilation, temperature control and lighting. Even when the clinic is closed, there will be a staff member checking in on your hospitalized pet. We are located on Danforth Avenue between Donlands and Jones Avenues. Just minutes away from Donlands subway. Conveniently approachable to the Riverdale, Danforth and Leslieville neighbourhoods. Riverdale Animal Hospital is accredited by the College of Veterinarians of Ontario for meeting the standards and regulations set by the committee of the licensing body. The CVO committee regularly conducts on site inspections on facilities and record keeping and issues certificates to complying companion animal hospitals in the province. Compliance with the standards and regulations set by the accreditation committee of the CVO is always observed at Riverdale Animal Hospital. Aside from providing clean and modern facilities for you and your pet, the management of the hospital makes sure that records are well managed, kept and confidentiality is exercised. Good ventilation, temperature control and lighting are features that the hospital is worth staying and visiting. We make sure that you and your pets are always comfortable and safe. Riverdale Animal Hospital management makes it sure that this is always observed and exercised for everyone’s safety and comfort.